These are challenging times to be a leader in the Archdiocese of St. Paul and Minneapolis. For that and other reasons, Father Andrew Cozzens expressed some apprehension about being appointed an auxiliary bishop for the archdiocese, which was announced during the 7:30 a.m. Mass at the Cathedral of St. Paul on Oct. 11. Archbishop John Nienstedt expressed gratitude for the Holy Father’s selection of Bishop-elect Cozzens. The 45-year-old priest, who teaches at the St. Paul Seminary and spent most of his childhood in Denver, was overwhelmed and overjoyed by the messages he has received from people in the archdiocese and beyond since the news was announced. he said. “The main experience has been just the incredible outpouring of love and support from people all around the country and from the people of the archdiocese. To experience so much encouragement and support and hope that people see in my appointment has been a beautiful experience this [past] week. Those who know him best say he appeared destined for the episcopate. His parents, Jack and Judy (see story about their reflections on the bishop-elect on page 21), saw early inklings of his desire for priesthood, and felt he might someday be a bishop. Others had the same feelings, including Mark Berchem, founder and executive director of NET Ministries in West St. Paul, where Bishop-elect Cozzens served in 1991-92. His roots in NET Ministries and St. Paul’s Outreach have made him a beloved priest with staff, volunteers and those reached by these two important ministries to teens and young adults. He is hoping that this background will enable him to reach out in a special way to local Catholics who have been struggling with almost daily reports in the local media about allegations of clergy sexual misconduct. “My main desire continues to be [being] a part of the healing that the archdiocese needs at this particular moment,” he said. “I would just say first, that this period has been also a deep and painful struggle for me, especially as a priest and now as a new auxiliary bishop. I feel the pain deeply, both the pain that there have been victims of abuse and the pain that some of my brother priests have not lived faithfully their commitments. So, I share that pain with all the people of the archdiocese. 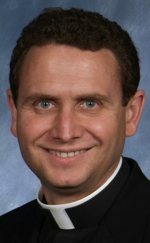 Bishop Cozzens will continue his teaching role at the seminary until his ordination on Dec. 9 at the Cathedral, which is the Feast of the Immaculate Conception of the Blessed Virgin Mary. This feast day holds special significance for him. His episcopal motto will be: “Lend us your heart,” a phrase from a prayer to Mary that Mother Teresa and her sisters prayed every day. At a glance1992-93: Co-director of campus outreach, St. Paul’s Outreach. 1997: Ordained priest of the Archdiocese of St. Paul and Minneapolis. 1997-2000: Parochial vicar, Cathedral of St. Paul. 2000-2002: Parochial vicar, Faribault Catholic Community (now Divine Mercy parish). 2002: License in Sacred Theology, Pontifical University of St. Thomas Aquinas, Rome. 2006-present: Assistant professor, St. Paul Seminary. 2008: Doctorate in Sacred Theology, Pontifical University of St. Thomas Aquinas, Rome. Bishop-elect Cozzens was born Aug. 3, 1968, and has one biological sister and a foster brother named Sergei, who was 15 when he joined the family. Young Andrew, called Drew throughout his childhood, had to struggle with severe allergies and asthma during his childhood. When he was 4, the family moved to Denver to be near a hospital that specialized in the treatment of asthma in children. He was befriended by an elderly priest, Msgr. Thomas Barry, when he was in first grade. The priest helped solidify his early inklings of a priestly vocation. After graduating from high school, he attended Benedictine College in Atchison, Kan. He was invited to join a summer household of St. Paul’s Outreach, and had a profound experience after his sophomore year that deepened his faith, said Gordy DeMarais, one of the founders and current executive director of SPO. Father Cozzens later worked for SPO as a mission leader, and helped form the Companions of Christ, a fraternity of priests and seminarians in the archdiocese. He also is fluent in Spanish, and is ready to get to work reaching out to the growing Latino population in the archdiocese. One of his important tasks in pastoral ministry will be to help local Catholics find healing and hope as they struggle with news reports in recent weeks and wonder where God is in the midst of this crisis. “I would say to the people, ‘We all feel this pain, and I certainly understand the pain,’” he said. “But, pain is never a reason for discouragement or despair. It’s always a reason to turn to Jesus and to ask Jesus to bring us mercy and forgiveness and new life. He said he wants to promote healing in other ways as well. 1991-92: Team leader, National Evangelization Teams.